The NYC Japan Street Fair: The NYC Japan Street Fair Map! 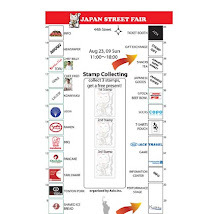 The NYC Japan Street Fair Map! The Fair is only three days away! Here's a handy map to help you navigate it better. Click on it for a larger view. We're on Madison Avenue between 43rd and 44th Streets, a block away from Grand Central Terminal. 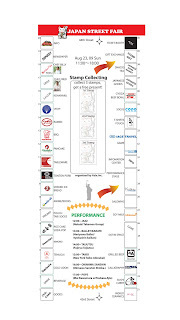 Additionally, you can win a free gift by collecting three stamps from your purchases at the booths. To answer a previous commenter's question, the performances will be located at the center of the block. See you there! Just out of Curiosity I noticed on other sites it says "Lucky Visitors can win round trip tickets to Japan" What would you have to do to get a chance at becoming one of these "lucky visitors"
updated with impending post. Thank you one million and please continue the gratifying work. blog platform are you using for this site? I'm getting fed up of Wordpress because I've had issues with hackers and I'm looking at alternatives for another platform. I would be fantastic if you could point me in the direction of a good platform. knowledge daily by reading such nice posts. You're so cool! I don't think I've truly read through anything like this before. So good to find somebody with a few unique thoughts on this subject. Really.. thanks for starting this up. This website is one thing that is needed on the web, someone with a little originality! and it's time to be happy. I've read this post and if I could I wish to suggest you some interesting things or tips.